The Steeple Obelisk is an elegant, decorative plant support, infilled with cross timbers and topped with a Ball finial. 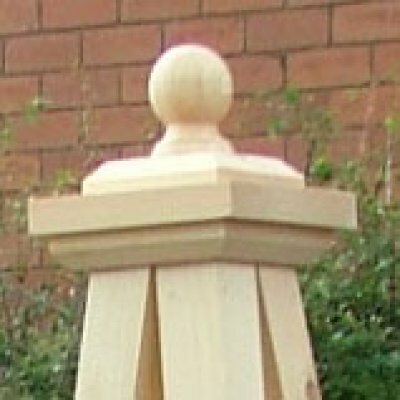 This Obelisk is very visible, an attractive way to add height and structure to your garden as well as support to your plants. The Steeple Obelisk is manufactured in our own workshops from Scandinavian Red Pine. We also supply all our obelisks with eyelets and spikes to secure them to the ground. You can only use these if you are positioning the Obelisks on soil or grass. The standard finish for the Steeple is Clear preservative or White Cuprinol garden Shade. 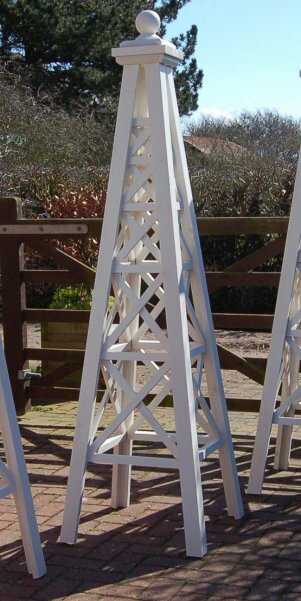 Obelisks are tower-like shapes used to support climbing plants. These structures may be purely practical as in poles, or sticks tied at the top, but the majority are ornamental too, bringing a sculptural and even colourful element to the garden year-round. Styles range from traditional Victorian through classic Edwardian to rustic country, and materials include wood, and willow. To choose the correct obelisk, it helps to know how the plant climbs. Plants with little tendrils have a hard time taking hold of wide wooden supports; look for thin crosspieces that they can hang on to, or opt for a willow or wire obelisk Examples of this type of plant are Sweet peas and passionflower. wrapping either their stalks or their. leaves round the support. The plants that climb by wrapping their leaves around supports prefer narrow supports; those that cling by wrapping their stems around supports are less fussy and will develop vigorously on just about anything. Other plants climb by setting out adhering roots. The roots originate from the plant stems. Aptly called holdfasts, these roots fasten extremely firmly so they can be a long-term solution. Ivy is effective when trained to the obelisk shape to look like a conical evergreen. Winter creeper (Euonymus fortunei cvs. ), climbing hydrangea, ivy are plants that climb in this way. Then there are the Scrambling type plants. These are primarily climbing roses, which will not attach themselves and should be secured to the support. Make sure your obelisk is well-anchored and is actually tall enough for the plants that you would like to grow.